You may have already seen parts of the 2014 Chevy Camaro… but we all know that it’s not nearly enough to satisfy our collective Camaro appetites. That’s why you should tune in to this page on Wednesday, March 27, 2013 to watch the live stream of the Chevrolet Performance Press Conference. The program starts at 12:45 p.m. ET and will last 30 minutes. Any word on if the 1LE package will still be available? 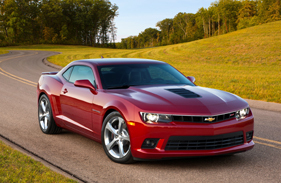 Sounds like the Z28 is SUPERIOR than the 1LE in every way. I hope so, because with standard carbon ceramic brakes, and what I’m sure are forged wheels, the LS7 engine, and near race interior, this car will demand quite the premium. It would be nice if GM throws non-moneybag, gear heads a bone and keeps the 1LE as a more affordable alternative. love the colour and it seems it has flared wheel wells, after watching again i really want thar one! I just watched the unveiling of the new, “refreshed” 2014 Camaro! A Z|28 with 500 HP! AAA+++! If the Z|28 comes as a convertible as well, I’m trading in my 5th Gen. Convertible for a 2013 Z|28 Convertible in that Matt White – White Diamond Tricoat – whatever – they – call – that – color of the Z|28 the brought onto the stage. I’m crying for joy!!! That was my hope. As awesome as the Z/28 is it will be out of some people’s, like myself, price range. The current 1LE is a heck of a preformer for the price. That is why I hope the 1LE continues on.